Lisette is a commercial litigation paralegal with over 10 years’ experience. She has a diverse litigation background which includes work on complex banking, securities, auto franchise, intellectual property, product liability, and insurance defense litigation. She also has considerable experience managing Securities and Exchange Commission investigations. Lisette has a comprehensive understanding of the discovery process, including e-discovery, and has managed many large-scale document productions. She has broad document database experience, and currently manages the largest document database at the Firm with over 3 million documents. Additionally, Lisette has extensive trial experience in both state and federal court, and has successfully managed many arbitrations and mediations. 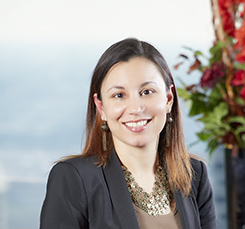 Lisette is fluent in Spanish and is active in the Firm's pro bono program. She provides Spanish language translations, acts as a liaison for the firm's Spanish-speaking pro bono clients and the Firm attorneys, and attends all meetings and court hearings. Lisette received her Bachelor of Arts degree in English in 2002 from the University of Illinois at Chicago and her Paralegal Certificate from Loyola University in 2003. She is a current member of the Illinois Paralegal Association and of the Chicago Chapter to Women in e-Discovery.